The word perfectionist only scratches the surface of a Virgo. But it’s the aptest description of their nature. And Mars in Virgo causes them to be nervous as they work to maintain that perfect lifestyle. If things don’t go their way, they become agitated and critical of everyone else. Virgos are known for their attention to detail. It’s part of what drives them. And Mars is all about our constructive and destructive energies and what drives us. So for Mars in Virgos, it’s all about keeping to a strict itinerary when getting things done. They have their way of doing things, and they get very upset when anything gets in their way. Mars in Virgo shine, when they have a goal or a project that needs to be done and done well. This is what keeps them moving forward in life, going from task to task and staying as busy as possible. If they don’t have something to do, they feel restless and useless. Keeping them busy gives them a sense of purpose. The Virgo Mars people have a subconscious need to be productive at all times and require a lot of reassurance that they have done a wonderful job. It’s important that they are recognized for their hard work, so they know their efforts were not in vain. This gives them the motivation to continue working hard to maintain their high standards. But because they are so concerned with doing a good job, they will pay attention to their partner in relationships to ensure their needs are being met. While they have tried and true methods they will stick to, they also realize their lover has wants and desires of their own. And Mars in Virgo is especially willing to learn new tricks and techniques to satisfy their lover. 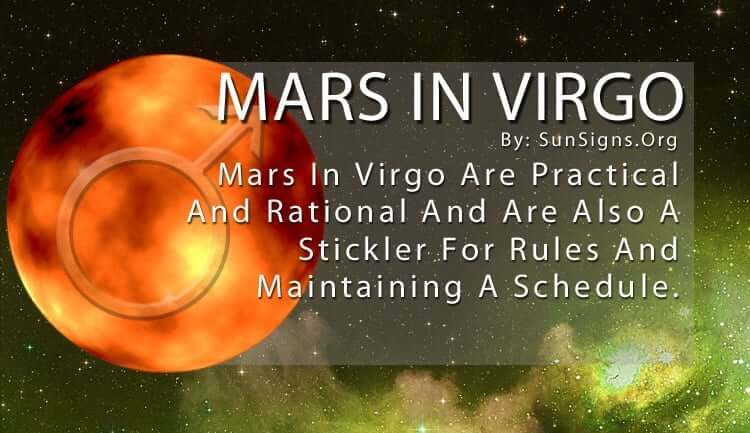 While Mars in Virgo people are practical and rational most of the time, they are also a stickler for rules and maintaining a schedule. So if that schedule gets broken up, they break down themselves. They are known to badger other people and criticize their techniques, trying to get them to follow their way instead. Thankfully, because Virgos are so busy this kind of grumbling doesn’t last long. If you let them vent a bit, they will let it go and get back on track to finish what they started. Just make sure they don’t take on too many projects at once, or else that nervous energy starts to work against them. Sometimes they take too much pressure and threaten to knock down the world they’ve created. Knowledge and experience are essential to Mars in Virgo people, so they welcome new encounters to expand their skill set. They approach their relationships the same way they approach everything else in life – with focus, tenacity and hard work. Be upfront and honest about what you want and they will give it to you, as long as you prove your loyalty to them. The Virgo Mars people take their time making decisions so be prepared to wait a while before taking things to the next level. But when you do you will have a devoted partner indeed. And they will take care of all of the responsibilities if you want them to because that’s what they do best. And with Mars in Virgo, you won’t have to ask twice, or even once!